A beautiful smile for your whole family! 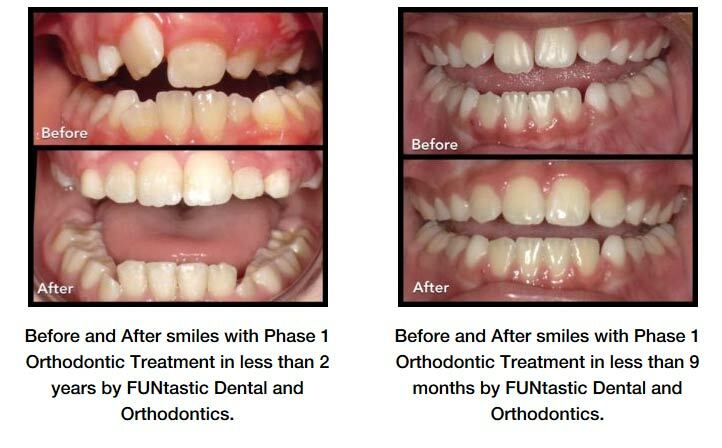 At FUNtastic Dental and Orthodontics, we don’t just care for children’s teeth. We also offer family orthodontics. Let’s briefly discuss what can work best for you. Children’s braces can occur in 2 phases, depending on their needs. Phase I is often called “interceptive” treatment and can start as early as 6 to 8 years old, and can last 12 to 18 months. At this age, 12 of the 32 permanent teeth are present. This is prime time to address harmful issues such as jaw discrepancies, thumb-sucking, crowding and “buck teeth,” because the child is growing quickly and adjustments can be made now. Phase I usually does not eliminate later treatment for permanent teeth. Between Phase I and Phase II, removable and/or fixed “appliances” (retainers) are used to guide the eruption of any permanent teeth during this time. Observation visits every 3-6 months help us monitor your child’s progress. Retainer insurance is available! A lost retainer is a huge source of concern (and frustration) for our parents. With retainer insurance, $250 buys you one whole year of the peace of mind that a lost retainer will only cost $35 to replace! Contrast that with the out of pocket $200 to replace a retainer EACH time your child loses it, without retainer insurance. This could easily save you hundreds of dollars (and a lot of resentment and digging through garbage cans). Phase II is often called “definitive” treatment. With only a few remaining baby teeth, this phase usually begins between ages 10 and 12, but people of all ages are finally giving their teeth the attention they deserve. These braces are used to develop a proper bite and achieve your best smile. We offer three options for braces: traditional metal braces, ceramic braces, and Invisalign aligners. Metal braces are made of high-quality stainless steel brackets and archwires, and sometimes use custom-colored elastics (rubber bands) for a playful smile. Ceramic clear braces have brackets made of clear material, yet still have a visible wire. They are less noticeable than metal braces, but are still the same treatment. Invisalign clear plastic aligners are removable, invisible trays, similar to a retainer, which you only take out for meals and teeth brushing. All three types of braces have distinct advantages and disadvantages that will vary from patient to patient. If you’re interested in adult braces or braces for children, please contact us today. Dr. Anita Bhavnani, D.M.D., M.S., will be happy to discuss all our family orthodontics treatment options with you and help you choose the method that will bring you or your child a healthy, beautiful smile for life! To schedule your appointment, please call us at 562-912-2007 or contact us online. We look forward to seeing you and helping you achieve the smile you’ve always been dreaming of!